This week I'm posting a few of my favorite Amish Friendship Bread Recipes (click to get more recipes) in honor of the 1 year Anniversary of the book release, Friendship Bread by Darien Gee. I loved the book and I personally know the author. She is a gem and her book is wonderful. She also writes under the pen name, Mia King. What do you have to do? We want you to pin this party post and link up something from your blog or from Pinterest. We will pin back.That simple. Here are my top favorite post. Remember if you pin we will pin back! 1-The novel, Friendship Bread by author Darien Gee. 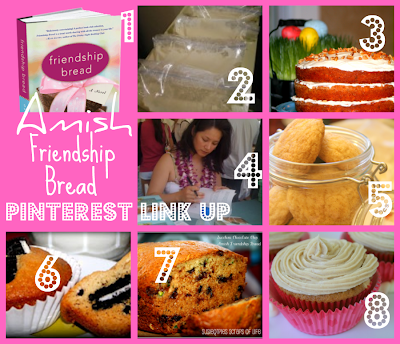 2- Starter recipe for Amish Friendship Bread- Yes it is here! it isn't a secret. You can start your own. 3- Carrot Cake Amish Friendship Bread- Just in time for Easter and spring! It is so good! Yes, the bread can be made into a cake! 5- Amish Friendship Bread Snickerdoodle Cookies- Did you know that you can make cookies out of the starter! This is one popular cookie in the Recipe Box on the Friendship Bread Kitchen Website. 6- Oreo & Cream Amish Friendship Bread-My girls love this variation. 7- Recipe for Zucchini Amish Friendship Bread- One of our favorites! 8- Irish Creamy Cafe Amish Friendship Bread Cupcakes- Yes, you can make cupcakes, too!